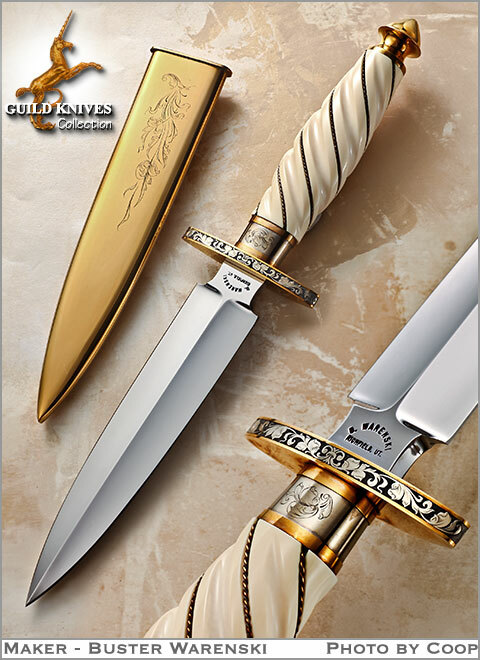 Gold engraved sheath, Gold belt clip on sheath, Gold guard with black fielded heraldic engravings, Gold separator band between guard and Gold wire wrapped swirl carved Antique ivory handle, and to top it all off, a Gold pommel. This is not a solid Gold knife but knowing Warenskiâ€™ high standards, the Gold applique to the steel furnishings is of the highest quality and thickness. Julie Warenski engraved tins knife. Buster had made only 2 or 3 of these Gold knives in his career, that were not of solid Gold. He did make several solid Gold knives, selling for huge sums of money. $850,000 was the most recent one offered for sale. 6 inches, double hollow ground. Elephant Ivory, spirally fluted with twist Gold wire. Gold over steel with engravings byJulie Warenski. Gold over steel with engraving by Julie Warenski.